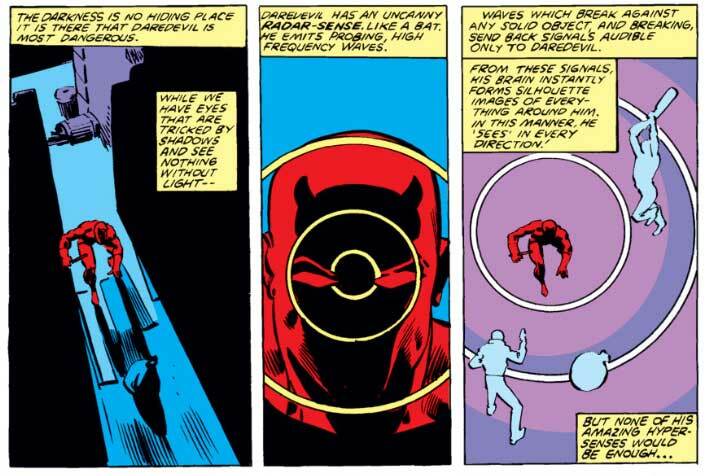 As I’ve mentioned over the course of my ongoing series A history of the radar sense, Daredevil’s ability to detect and identify objects and obstacles has been described in several different ways. One interpretation is that is actually works like a real radar in that Daredevil’s brain sends out an electromagnetic signal which bounces off surrounding objects and returns to his brain. A variation on this theme (see panels below, from Daredevil #167 by David Michelinie and Frank Miller) is the active sonar which instead suggests that the signal sent out is ultra-sound. The principle is still the same though. Other interpretations over the years have been 1) the radar as a combination of Daredevil’s other senses, 2) the radar as some unknown mystical sixth sense and 3) the radar as an ability to sense differences in air pressure. The way I see it, item number one on this little list would actually be (passive) echolocation since no other sense aside from hearing would actually yield the kind of spatial information that could fill in for sight. This interpretation is close to what Bendis suggested while he was writing Daredevil and also comes pretty close – in theory anyway – to the radar sense in the Daredevil movie. While the interpretation of the nature of the radar sense has varied quite a bit, the things that throw Daredevil off his game have not. Time and time again, we’ve seen Matt complain about excessive noise and general turmoil interfering with his ability to make sense of his surroundings. This could mean that it simply makes it harder for him to concentrate – assuming that concentration is required – or that it physically interferes with whatever signal that he depends on, whether it’s a sound he sends out himself or something he picks up from the environment. I’ve gradually come to favor the theory that Daredevil’s radar sense is sound-based and that it should rely on the same ability that many real life blind people have, though the ability would be greatly improved due to Daredevil’s heightened sense of hearing. This would not only explain why he avoids noise and massive crowds, the fact that no additional abilities are required is appealing for other reasons as well. If Matt can emit high-frequency sounds, where would these come from? Sounds don’t just appear out of thin air. Does he have a clicker in his brain? For that matter, where would a radio signal come from? Where would the extra energy come from to fuel such an emitter? Of course, the Marvel Universe is full of characters who rely of massive amounts of energy that they are just magically able to tap into, but for Daredevil – an admittedly low-powered character – a more down to Earth solution is simply more elegant. The idea that the sense of pressure on the face many blind people experienced was due to air pressure stuck around for quite a while and the phenomenon of human echolocation wouldn’t be carefully examined until the mid-1940’s (echolocation in bats had been described in 1938 by a Donald Griffin who also coined the term). In experiments over the next decade, it was shown that hearing was both required and sufficient to account for the phenomenon. That doesn’t completely exclude other factors, but we know for a fact that the ability to echolocate diminshes with decreased hearing and is completely absent in the deaf. How does human echolocation work? Hearing and vision are known as our distal senses in that they give us direct information about things and events located or occurring at a distance from us. Sound gives us information in two different ways. There’s sound that comes directly from the source of objects that generate their own sound. This sound can also interact with otherwise silent objects and be absorbed or reflected. The quality of the reflected sound differs from the original sound in that the pitch and intensity will be different. This difference can be discerned by the human ear. One very simple test you can do yourself right now is to close your eyes (not necessary, but it helps), make a consistent “shh” sound and pass you open hand, fingers together, in front of your face with your palm facing in and hear how the sound changes. These sound changes are subtle to the untrained ear but the fact is that we listen quite a bit to echoes without thinking about it. Those of us who still have all of our senses might sometimes have a hard time separating them and we may not notice that we’re conscious of the expected acoustic properties of a room until they’re altered somehow. It’s possible, for instance, to make a small room sound like a larger one and people will easily notice that something seems “off” when the look of a place doesn’t match the sound. Of course, these everyday experiences are a far cry from the abilities of the most highly skilled blind echolocators out there. While not exactly common, there are enough accounts of totally blind people being able to walk around effortlessly without using a cane or any other device to establish that object detection using only the sense of hearing is indeed possible. Using everything from the ambient sound in a room to the person’s own footsteps or self-produced sounds (most commonly tongue clicks or a snap of the fingers), it is possible to locate larger objects and even determine their shape and what material they’re made of from several feet away. Though not everyone is able to attain a very high level of skill, echolocation can be learned by just about anyone. Since the phenomenon of echolocation first garnered serious scientific investigation, it’s been assumed that the higher frequencies (above 8,000-10,000 Hz) are the most important for object detection. This may be in part because mammals that use echolocation, such as bats and dolphins, use high frequency sounds. High frequency sounds are also better for detecting smaller details because of their shorter wavelength, and much of the early research seemed to confirm their importance for echolocation in humans. In the last decade, however, low-frequency sounds have shown to be worthy of a second look, particularly when it comes to the perception of large features such as walls and buildings. It’s been demonstrated that there is a so-called spectral shift due to the tendency for the background sound of a room to be different in sound pressure near walls compared to the middle of the room. This is much more noticeable for lower frequencies than for higher ones and allows for people to literally hear the presence of a wall when moving toward it. For lower frequencies, this translates into a distance of 3-6 feet (1-2 m). If we insert my previous hypothesis that Matt Murdock is able to hear higher frequencies than the normal human, as well as being much more sensitive to lower frequencies (where normal humans don’t do very well at all), his ability to use echolocation would be enhanced in some crucial ways. His ability to detect the presence of large features of the landscape would increase many-fold to the point where actually “feeling” both rows of buildings on either side of the road sounds plausible. Since much of the ambient sound available for detecting objects – in the case where a person doesn’t rely on self-produced sounds – happens to be lower frequency sound, this ability is further supported. Better access to high frequency sounds would have other benefits. There aren’t as many of these just floating around, but higher frequencies allow for much finer detail. Another thing to keep in mind is that, aside from better echolocation, Matt would have a huge advantage over regular blind people due to his generally heightened sense of hearing. He’d be able to hear exactly where people are, be much better attuned to the location of machinery and other sources of sound and just have much more information at his disposal. In the comic, Daredevil’s radar is often utilized on an “as needed” basis. Some writers have probably imagined that this ability is something he’s tuned into every waking minute, but instances of his sensing something only after having first used his other senses are very common. One of the more extreme examples of Matt sequentially analyzing a scene comes from Daredevil #104 (vol 2), by Ed Brubaker and Michael Lark. Matt comes home, panels from Daredevil (vol 2) #104. While this scene might seem extreme (personally, I think the smell of blood should have been the single most noticeable thing about his coming home), it does make sense that he’d take in a scene in a different way than a normal-sensed sighted person would. Vision is such an important sense to humans that it’s difficult to imagine it taking a backseat to other impressions. Approaching this scene from a “radar as echolocation” perspective, I also have no problem imagining this ability as consisting of a subset of abilities which require varying amounts of concentration and effort. A general sense of being near an object or wall might require no effort at all and be a constant feeling as obvious as seeing and hearing, whereas eliciting a more detailed pseudo-visual experience of objects farther away than ten or fifteen feet would possibly require actual focus and depend on a different kind of analysis of the soundscape around him. 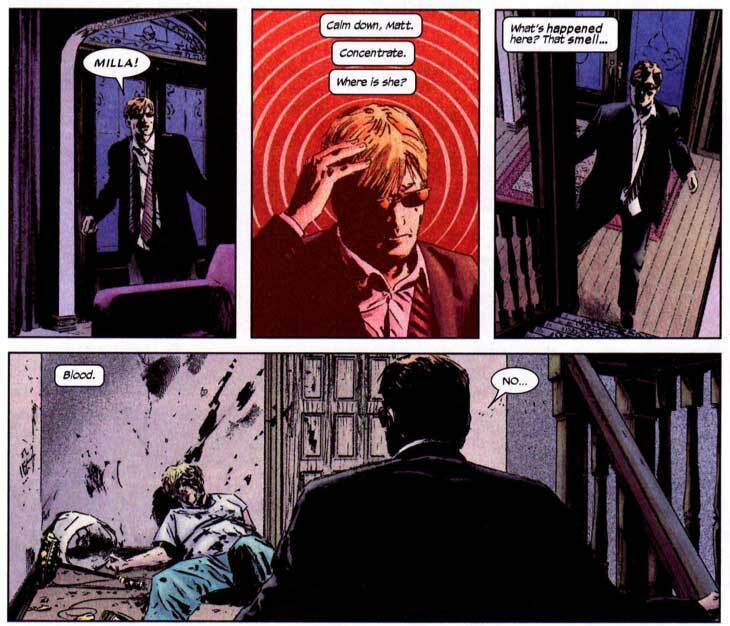 There is no way of knowing how a human brain would react to being inside the head of a blind person with dramatically enhanced hearing, but this kind of layered approach would be consistent with Daredevil’s history of never walking into anything while not always “seeing” something right away. The way I see it, the “radar as echolocation” hypothesis (wow, doesn’t that sound pretentious?) has several things going for it. First of all, not having to rely on a novel sense which would be dependent on an unknown energy source is more elegant and feels much less like the “cheat” I’ve occasionally seen the radar sense described as. It is also clear that some normal blind humans have, in fact, developed such an impressive ability in the absence of superpowers that adding extremely heightened hearing to the mix would push this skill to new extremes. This interpretation of the radar sense also fits the comic book well, and actually makes more sense given Daredevil’s strengths and weaknesses. It would explain why excessive and chaotic noise is such a nuisance. I would love to hear what my fellow science geeks think about this subject. And, if you’re interested in learning more, I recommend Kuljit Mithra’s interview with Daniel Kish, a blind echolocation expert (you can find it in the Interviews section on ManWithoutFear.com) as well as all of the various YouTube clips available of the now deceased blind wunderkind Ben Underwood. Christine, this post is as informative and interesting as ever! One aspect of Matt’s echolation/radar sense I never considered before your post here is how integral ambient sound would be to its proper functioning. If Matt were to be placed in a perfectly quiet room – if such a thing were possible – he would have no input from his radar sense until he himself started making noise! Of course, if one had Matt’s hearing, one would hear the human body making noise all the time. Perhaps then, his own heartbeat could function analogously to tongue-clicking and finger-snapping for non-superheroes – to create echos? Maybe that’s the odd energy that Matt’s body is emitting – the sound of his bodily functions! This actually makes a lot of sense and would explain how Matt has been shown at times to be able to find weaknesses in opponents or materials. Combined with your thoughts on random thermal motion it’s logical that Matt can resolve the world both in a unique way and with great depth. I would like to be the first to nominate you to write the DD passages for the next edition of the MHB … please take the job. This post was easily as informative as I thought it would be. It’s fantastic. I particularly like the fact that this explanation fits so consistently well with the established facts, such as how and why excessive noise not just bothers him but could potentially overwhelm his radar sense. I’m still curious about the extent to which you feel his other heightened senses contribute to his radar sense (the comic sometimes states at the beginning that his heightened senses together form his radar sense, although I’m paraphrasing a little), or if it should be reduced to his hearing alone (like in the movie). Thanks for the feedback, guys. This post could have easily been twice as long and I may eventually collect all of these posts, along with previous posts that have to do with Daredevil science, in a pdf-file and add some extra content. One area I almost skipped completely was how much being able to hear ultrasound would add to the mix. I also wanted to point out how the radar (regardless of what it actually is) would differ from sight when it comes to “seeing” things far away. As long as there is sufficient light, people with normal sight can literally see all the way to the horizon, many miles away. For Daredevil, it would be more like walking around in a pitch black cave with a light bulb on his head. Regardless of whether we’re talking about radiowaves, emitted ultrasound or passive echolocation, it would have to be more of a short-range sense. This is also consistent with the comic since Daredevil very rarely senses anything more than roughly a block away (though he may hear and smell things, of course). Exactly why this is is something I’d like to talk about more in my final “very unofficial science of Daredevil” document. As for what Andrew mentioned about my thoughts on the radar being a combination of the senses, not just hearing, I’d say this: Would someone like Daredevil (or any real life blind person for that matter) base their perception of the world on input from every available sense? Absolutely. If this is what is meant by the “radar sense” it would be a combination of all his senses. But, if we use the term to mean Daredevil’s ability to “sense” the presence of objects around him in a way that is analogous to vision, only hearing is needed. Smelling a steak cooking on the stove will let someone know that there’s a steak cooking on the stove, but that doesn’t necessarily translate into a more tangible feeling of the frying pan as a physical object. Sensing isn’t knowing. You can sense something without knowing what it is, and you can identify the presence of something without sensing (or seeing) it. I suppose one way of looking at it would be that the radar sense (echolocation if you ask me) offers the schematics whereas the other senses, including other types of sound-based information, would add the information needed to decipher the schematics. In fact, a great many objects are not identifiable based on shape alone. If you can’t access color information (or even fine detail), you’re going to need something more to go on. I think I’ve mentioned this before, but seeing clearly consists of more than just being able to avoid colliding with obstacles or recognizing shapes; which is one of the reasons I find it silly when people claim that having Daredevil’s senses would make a blind person sighted. It would certainly be very helpful and I’ve said before that I think Daredevil is, for the most part, a believable superhero. I don’t see how being blind would hamper his fighting skills at all, but to suggest that Matt doesn’t still have something of problem in the seeing department doesn’t make much sense to me. Thanks for the clarity Christine. I can completely understand how his sense of hearing alone is all that is really needed to explain in an analogues manner his method of “seeing”. The only other sense that I can think of that could add anything meaningful to that equation would be his sense of touch, and his ability to sense vibrations and movement, akin to how some spiders operate (If I recall that is what the hairs on their body allow them to do.. But now I’m creeped out thinking about spiders). Could sensing vibrations caused by movement also allow Matt to map his immediate surroundings in his minds eye? I may sound terrible ignorant I realize, but I always imagined him being able to do this for some reason (even though I can’t think of an example off the top of my head of it being depicted in the comics). Hm, do I think DD might be extra sensitive to vibrations? Sure, that makes sense. However, sounds and vibrations, whether they travel through the air or can only be felt by touching something solid that acts as a conductor, are really just different aspects of the same thing. Depending on the frequency, sounds can both be heard and felt and below 20 Hz we stop hearing sounds and can only feel them as vibrations. Still, regardless of whether DD would be more sensitive to vibrations in the air, he would most likely be able to hear these vibrations too and touch wouldn’t add much to the equation. It’s true that spiders pick up on vibrations the way you describe, but that’s just essentially their way of hearing. Sounds are vibrations, the only difference between the two terms is that sounds are vibrations that can be heard because they happen to have the appropriate frequency. Of course, there’s also the more large scale movement of air caused by wind or the quick opening and closing of a door, and this might be what you’re talking about. The latter is due to drag, i.e. the forces that oppose the movement of a solid through a fluid or gas. These effects are highly dependent on the speed of the object though (as well as the nature of the medium, in this case air). If an object of the appropriate dimensions is moving toward you at a high enough speed, air will build up in front of the object, and an area of lower density will form behind the object in ways that can be felt. Okay after reading that… first, yikes what a read. Very good interpretation. Ex. A normal person hears leaves rustling, focuses more attention on that point, sees a snake they missed before. Matt hears a distant click, focuses his radar more on that point up in a distant window, and spots an armed criminal. I think of it like this because I am sure I remember instances where Matt’s radar worked irrespectively of his sense of hearing. I think I even remember an issue where Matt was deafened, but could still use his radar sense to locate hand ninja’s (can’t name the issue but I think that is what happened). Another thing that has always seemed to be a deterrent to the ‘echolocation’ argument to me, is how ignorant Matt is to sound and the speed of sound. Before I continue along that line of thought I will clear this up. Matt gets disoriented by loud, abrasive sounds. However, so do normal people, hence flash bang grenades. Now considering how much more adept Matt is at hearing, it would make sense for loud sounds to disorient him to a larger degree. Considering how much raw data his brain already supposedly has to analyze (whatever incoming ‘waves’ he is converting into location and sillhouettes, it makes sense that an overload of his auditory sense could also disorient his brain to the point where he cannot focus his radar sense. Back to sound. With all the things Matt does, sound is actually a fairly slow catalyst in terms of his reaction. A normal person sees the light bouncing off of an object, and understands what that object is in the time it takes that light to get interpreted by their brain. It really is a much more effiecient system than echolocation, at least when attempting to process real world data when there is visual light available. For Matt’s senses to work as echolocation, these steps would have to happen before he could interpret the real world data. this may not seem like much, but light is 874030 times faster than the speed of sound. In the time it takes a normal person to process any kind of visual information, Matt would still be waiting for the sound waves to reach his ears. This seems impossible for a person shown to have abilities greater than any real person. If this was true, bullets, a large vairiety of which move faster than sound, would be even more difficult for him to avoid than a regular person. I like to think of Matt’s radar sense as a giant real world spread sheet. Matt himself is in the exact middle and any details and items on the sheet within range (which I won’t try to quantify as it has ranged from 50m to like a km) are things Matt is able to interpret as real world data whenever a ‘wave’ of his radar sense passes by. when he smells or hears something worthy of recognition, something in his brain recognizes it and he highlights it on the fluctuating spread sheet that is his radar sense and Matt pays more attention to it then something else. Of course, a highlighter can also be bad to a spread sheet. Too much sound or scent and it can overload him, highlighting too many things, making it difficult for him to focus on something with his radar sense. Anyways that my interpretation. I like to think the ‘waves’ Matt sends out, whatever they are, must be much faster than sound. They may be some form of radio waves, but regardless it would be much more realistic if they moved at the speed of light. Possibly he has a ‘ticker’ as you have said, in his brain, that isn’t actually any physical manifestation, it is actually just a combination of everything in his brain overcompensating for his disability. Combine this with the ‘radiation’ he was smashed with, and him sending constan radio waves out with his brain doesn’t seem unlikely. It does occur to me that this sentence alone, Christine, goes a long way towards improving Matt’s ability to fight, dodging punches and whatnot. It also helps explain how he can dodge bullets, independent of his radar (or echolocation, or what have you). Good. Got that out of my system. Now, moving on. I am torn between Matt’s radar as echolocation and Matt’s radar as a sixth sense. I always assumed it was the latter. (The issue Marc is thinking of, by the way, is issue 174, one of Frank Miller’s.) I always assumed this from the crossover Daredevil/Batman issue. I know it’s non-canon, but it was the first time I personally had ever really seen Daredevil’s radar sense defined. It clearly stated in the issue that Matt detected Batman with only his radar, since Batman — being Batman — was so skilled at stealth that even Daredevil’s hearing missed him completely. If you close your eyes and walk towards a wall, your inherent echo location will tell you when you are close to it. There have been tests.